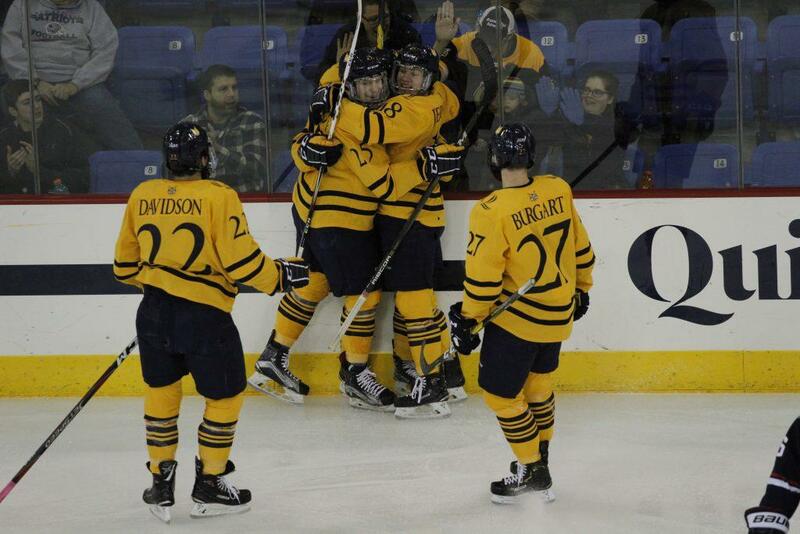 The Quinnipiac men’s ice hockey (2-0-0, 0-0-0 ECAC Hockey) team pulled out a victory in the “Battle of Connecticut”, taking down a non-conference foe in UConn (1-1-0, 0-0-0 Hockey East) by a score of 4-2. Despite taking an early 2-0 lead with goals from senior defenseman Brandon Fortunato and sophomore forward Odeen Tufto, the Bobcats were rather sluggish in the opening period of play. Keith Petruzzelli made some key saves early on to bail the Bobcats out, but UConn was still able to get on the board in the first with a goal from freshman forward Jonny Evans. The Bobcats came out with far more energy in the second and third periods, winning the majority of puck battles and spending a lot of time in the offensive zone. This effort and energy was rewarded with 7:28 remaining in the second period, when sophomore forward Alex Whelan fed William Fällström, a freshman, who buried his first collegiate goal. The third period was one that really tested the Bobcats. After Brogan Rafferty was ejected from the game for an enormous hit on UConn winger Ruslan Iskhakov, the penalty killers got their fair share of ice time by killing off a five minute penalty. Although the Huskies cut the lead to 3-2 on another power play opportunity in the third, they were unable to succeed when pulling the goalie with two minutes left. Fällström iced the game for the Bobcats with his second goal of the game, with the empty net tally. The Stockholm, Sweden native has impressed head coach Rand Pecknold early in his young career. Fällström’s contribution in tonight’s game will be expected of him going forward, as well as the 11 other freshman this Quinnipiac roster is comprised of. The energy of these young guns combined with the veteran presence of seniors like Chase Priskie and Scott Davidson has demonstrated improvements already from last year’s forgetful season. The Bobcats will be put to the ultimate test in their next contest, going up against a Boston College squad who flaunt 11 NHL draft picks. Puck drop is set for 7 p.m. on Friday in Hamden.